SmartAcre worked with client, Maintenance Connection, to build an automated and customized attribution program in one month. Maintenance Connection brought SmartAcre on board not only to accelerate their marketing campaigns, but also to gain a deeper understanding of the effectiveness and impact of their lead nurturing efforts. After hearing this challenge, and attending a number of cross-team brainstorming sessions, SmartAcre worked with Maintenance Connection to build a process within Pardot and Salesforce that allows Maintenance Connection to report on the influence of marketing activity to movement of leads through the pipeline. Because Maintenance Connection’s marketing engine relies heavily on nurtures, the top priority was to gather tracking information on these efforts. 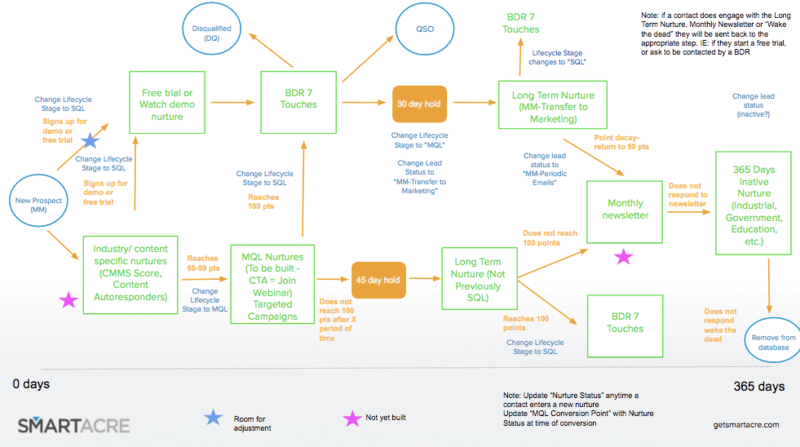 At the outset of the project, SmartAcre built a map of an ideal, full-funnel nurture program to fuel Maintenance Connection’s marketing engine. This included both high performing nurtures already in place, and net new nurtures to fill the gaps in Maintenance Connection’s efforts to push leads through the buyer’s journey. We then identified how to best tie the data from the nurture programs running in Pardot to Salesforce. To do this, SmartAcre recommended the implementation of two new fields that would map across Pardot and Salesforce. This field was created to populate at the beginning of every active Engagement Studio program with the name of the respective program. This ensured that anyone in the program would have a “Current Nurture Status” field. At the end of each nurture Engagement Studio program, this field is cleared. These three fields were created to capture the value in the “Current Nurture Status” field at the time a lead converts to the appropriate lifecycle stage. To implement this, SmartAcre built a Salesforce workflow rule based on the “Lead Status” field to update the conversion point. Once a lead status changed, the appropriate Lifecycle Stage (MQL, SQL, Customer) was assigned. For example, at the point in time which the Lifecycle Stage changed to MQL, the “MQL Conversion Point” field is populated with the current value in the “Current Nurture Status” field. Once populated, this field is locked and will never change. Once the technical set-up was complete, SmartAcre worked with Maintenance Connection to build custom reporting out of Salesforce. The goal was to ensure Maintenance Connection had full visibility of the impact of marketing nurtures and campaigns on business results and progression of a lead’s life cycle. By optimizing the current nurture process and ensuring that existing nurtures could be mapped to leads in Salesforce, we set up Maintenance Connection to successfully track their leads. We created custom fields in Pardot that would better track a customer throughout the funnel, assigning them a status that would change with each step in the customer journey. Finally, we set up a Salesforce report that could easily provide Maintenance Connection with a better understanding of the impact of their marketing campaigns on business. With insight into how their nurturing efforts are impacting the bottom line, Maintenance Connection is enabled to make data-based adjustments to their marketing mix, messaging and goals. Maintenance Connection is the sole provider of a CMMS/EAM solution uniquely positioned to manage all aspects of a maintenance operation, right at the fingertips of maintenance personnel. Maintenance Connection provides solutions in all aspects of maintenance, all packaged in an intuitive and easy-to-use interface that allows you to manage maintenance, not software.